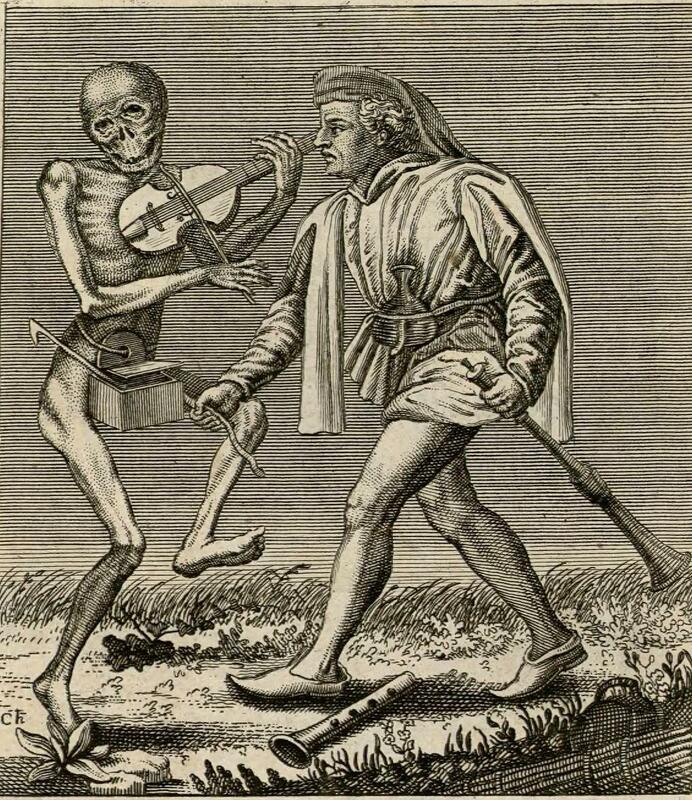 The violin, on the other hand, is often associated with the Devil, as in such pieces of music as Danse Macabre, L’Histoire du Soldat, and “The Devil Went Down to Georgia.” In folk tales, the Devil enjoys wagers, betting his own gold fiddle against the souls of his opponents. 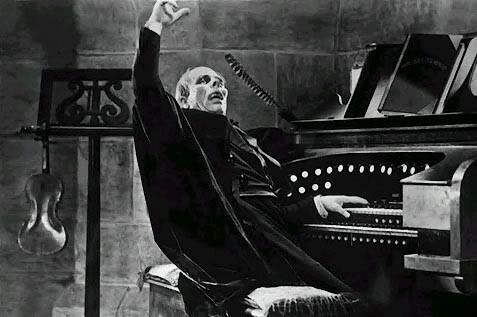 He may also bestow musical talent in exchange for a soul, a prominent part of the myth surrounding Tartini’s “Devil’s Trill” Sonata. Later, the great Italian virtuoso Niccolò Paganini was the subject of lurid rumors that he had sold his soul, and worse: Theosophy founder Madame Helena Blavatsky included Paganini in her story “The Ensouled Violin,” and graphically embroidered on the notion that the strings of Paganini’s violin were made from human intestine, and that his uncanny ability to mimic the human voice with his playing actually came from a spirit trapped within the instrument. A similar story is part of the mythology of the Blues: Robert Johnson was supposed to have met the Devil at a crossroads at midnight, where he traded his soul for his legendary guitar-playing ability. The legend formed the basis of the Ralph Macchio film Crossroads and was parodied on Metalocalypse (in the episode “Bluesklok”). Interestingly, Elijah Wald, in his book Escaping the Delta, has shown that the same story was originally attributed to a Tommy Johnson and then transferred to Robert when his legend outpaced Tommy’s. Naturally, the whole thing has roots in folklore: Wald points out, “When Harry Middleton Hyatt collected stories of musicians going to the crossroads to gain supernatural skills, as part of a vast study of Southern folk beliefs in the late 1930s, he reported as many banjo players and violinists as guitarists,” as well as an accordionist. Why is there such a connection between fiddling and death? In the Middle Ages, instrumental music was considered both profane and frivolous, closely associated with itinerant, always-suspect actors and minstrels and the drunken singers in taverns. 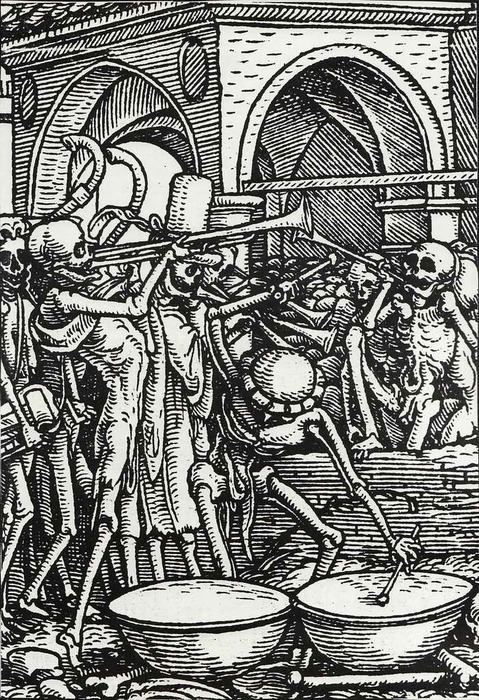 In depictions of Death (usually as a skeleton, the same as now), musical instruments were often a symbol of the sinfulness, vanity, and futility of all human activity, not just music. (The popular image of Nero “fiddling while Rome burned” probably owes much to this symbolism, as the violin had yet to be invented in Nero’s day; likewise, contrast the supposed indolence of grasshoppers with the industry of ants.) The image of a grinning skeleton “playing” his victims into the grave may have struck the medieval viewer as cruel irony, a just punishment, or as a warning. In his tone the violinist must first convey the deep grief that is present in the gathering, and then transform it into a thing of beauty. By the time he is finished, a deep and plaintive calm should have descended, and the bereaved should be ready to hear the eulogy. . . . The violinist’s is a position of great responsibility, akin in many ways to that of a priest or shaman, and should not be taken lightly. Alas, the book was a hoax, supposedly concocted by Kriwaczek to increase his bookings as a violinist at—you guessed it—funerals. Still, I can’t help but feel that Kriwaczek’s story, with its dueling Funerary Violinists, buried secrets, and cameos from outsized characters including composers, Popes, and virtuosi, would make a smashing TV program, a historical saga with more than a touch of gothic intrigue. He blew tentatively and stopped suddenly, startled and yet pleased at the note he had elicited. It had a quality of infinite distance in it, and, soft as it was, he somehow felt it must be audible for miles round. It was a sound, too, that seemed to have the power (which many scents possess) of forming pictures in the brain. He saw quite clearly for a moment a vision of a wide, dark expanse at night, with a fresh wind blowing, and in the midst a lonely figure–how employed, he could not tell. Perhaps he would have seen more had not the picture been broken by the sudden surge of a gust of wind against his casement, so sudden that it made him look up, just in time to see the white glint of a sea-bird’s wing somewhere outside the dark panes. Just as frequently it’s a MacGuffin that activates the plot: a Stradivarius is as valuable as a van Gogh, and serves as well as any other objet d’art as the motivation in a murder mystery. An example is the three-quarter sized Strad, the Piccolino, at the center of Gerald Elias’ mystery Devil’s Trill, the first of a series centered on violinist-sleuth Daniel Jacobus. And despite its unusual varnish, the titular instrument of the 1998 film The Red Violin is haunted more by tragedy and human foibles than by any supernatural evil. Likewise, it doesn’t seem that it would be that hard to escape the vengeance meted out by the grand piano in “Mr. 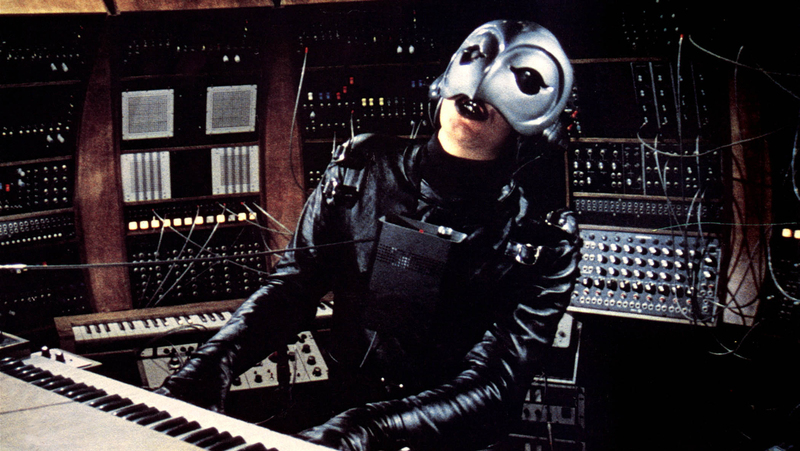 Steinway,” a section of the 1967 anthology film Torture Garden, based on stories by Robert Bloch. In the story, the piano in question belongs to a prominent virtuoso, a gift from his mother, and his devotion to it is tested when a young lady (played by Barbara Ewing) enters his life. The black wing shape of the piano is a looming presence in the film version, always in the background or casting its shadow over the doomed couple, and the Oedipal implications of the pianist’s relationship with his mother, never seen but personified by the piano, are left as unspoken subtext. So far, so good, but by the time the piano lurches into motion and pushes the intruding girl out the window, we’ve entered the realm of delirious high camp. The lesson: music is a jealous mistress. Finally, as a bonus, I present one of the most bizarre (and gratuitous) examples of this trope, from the 1976 film The Town That Dreaded Sundown: death by trombone. Happy Halloween!